Stock photo of people walking up to the magic carpet lift with their tubes at the Coca-Cola Tube Park on Blackcomb Mountain, Whistler Blackcomb, Whistler, British Columbia, Canada. This stock photo includes people walking up to the magic carpet lift with their tubes at the Coca-Cola Tube Park on Blackcomb Mountain, Whistler Blackcomb, Whistler, British Columbia, Canada. Located in the Base 2 Zone on Blackcomb Mountain, the Coca-Cola Tube Park offers great fun for the young and the young at heart. There's no skill or equipment required - just a sense of adventure and a desire for excitement. 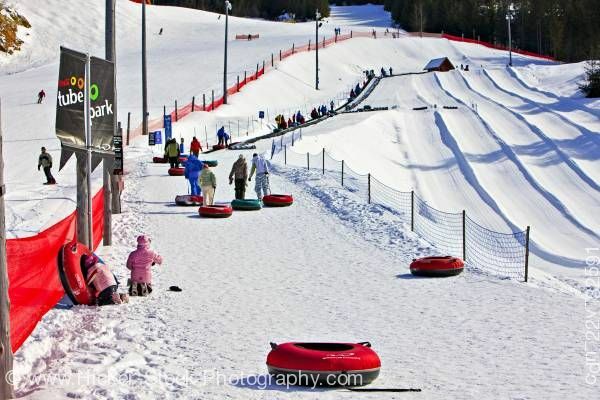 Whistler Blackcomb's Coca-Cola Tube Park has eight lanes varying in difficulty from Green to Blue to Black. Lanes are 1000' and a state-of-the-art conveyor lift makes travelling to the top a breeze. Family fun doesn't have to end when the lifts close because the Coca-Cola Tube Park is open into the evening. Primary access via the Excalibur Gondola.